This blog page provides background information on the “Family Style” article in the October/November 2010 edition of Welcome Home Des Moines magazine. 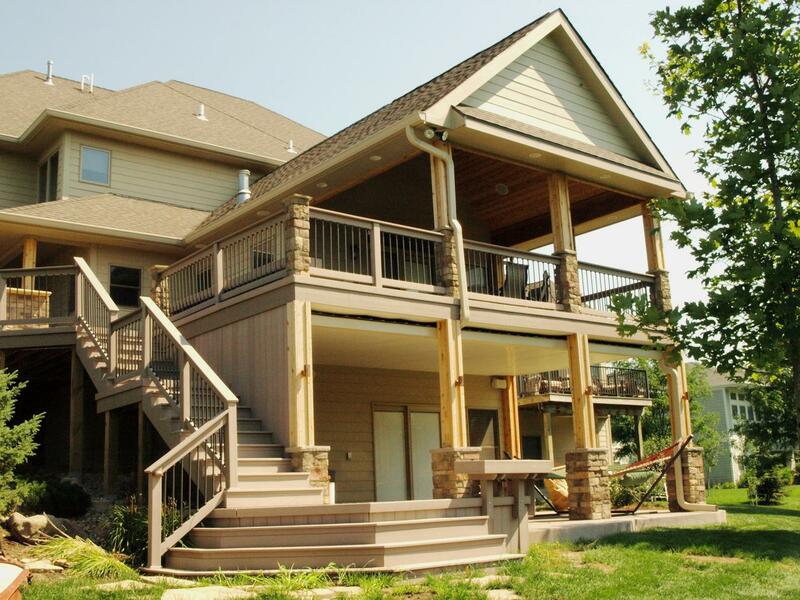 The article features a project by Archadeck of Central Iowa. 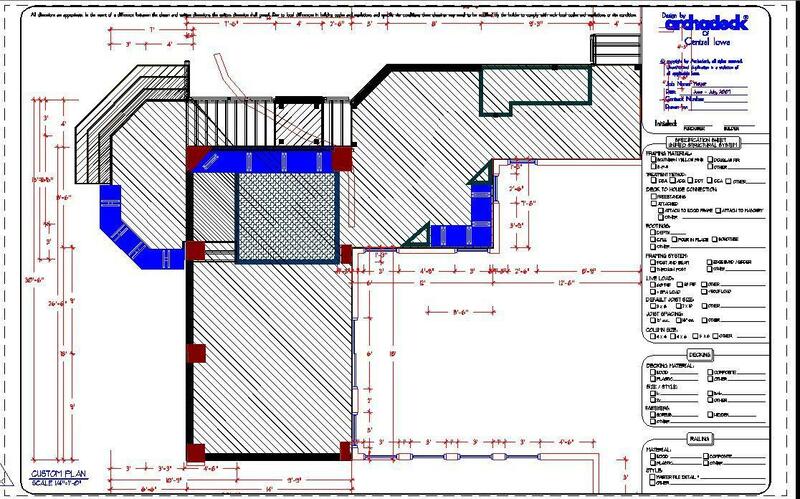 I first met with Ruth and Scott in July of 2007 to begin assessing their project desires and ways to incorporate them into a new outdoor living space. 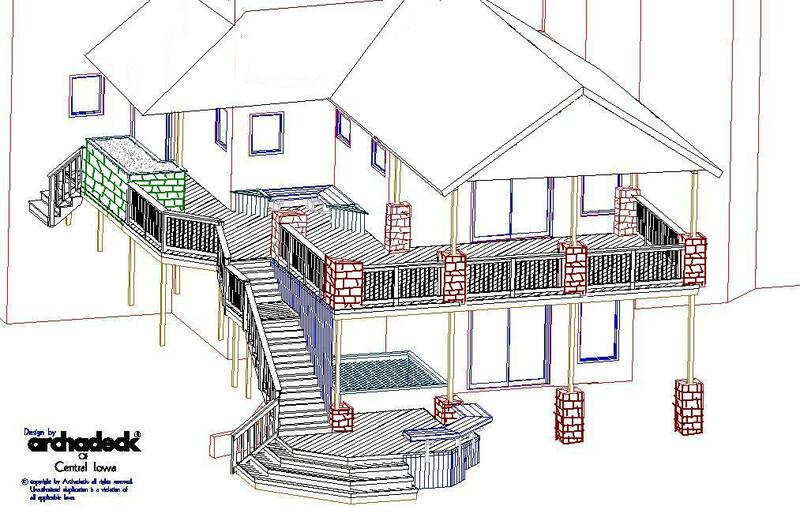 By mid-September, we had a design in place and the Meyer’s deck, open porch, patio and outdoor kitchen project was slotted into our construction queue to start later into the fall. With demolition completed and structural framing underway, we poured the new colored concrete patio in late October. At this point I should interject…in case you’re wondering…we do build year-round. In fact, we prefer 30-degree temperatures for building to 90-degrees. But, at 30-degrees (and lower) any precipitation and weather-related delays can take on any number of forms. But, the benefit of “off-season” (if there really is such a thing in this business) building is that your enjoyment of your new outdoor living spaces is not necessarily delayed; you’re likely going to be enjoying your new space (as opposed to swearing at your old space) that first nice evening or weekend in spring…as opposed to just starting your project then…and waiting out (and swearing at) the spring rains. 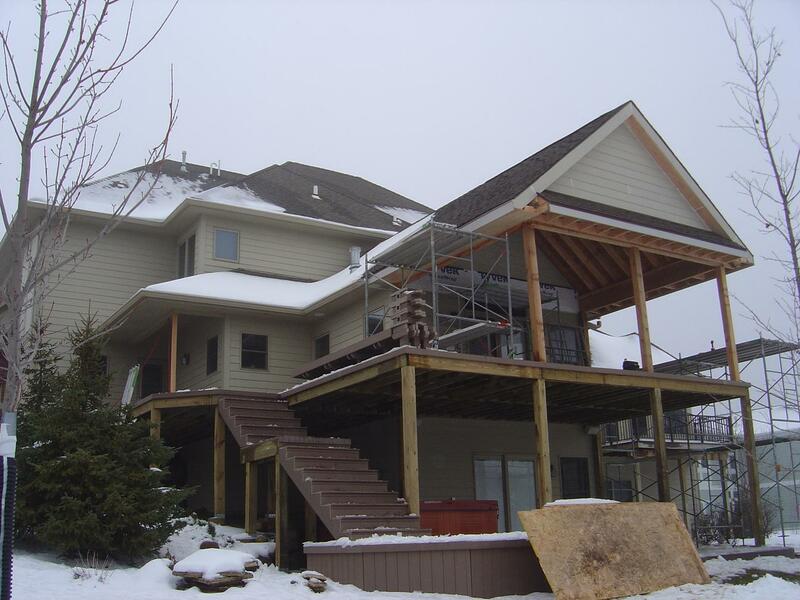 So, if you want early spring enjoyment of your new outdoor living spaces (weather and scope permitting), consider designing and building “off-season.” Otherwise, think: call early…maybe May (weather and scope permitting). 2007 was the last “mild” winter I remember; the last 2 have been…”brutal” is a good word. So, we were able to continue slow but steady on Meyer’s project (as well as a couple of others) through the winter. 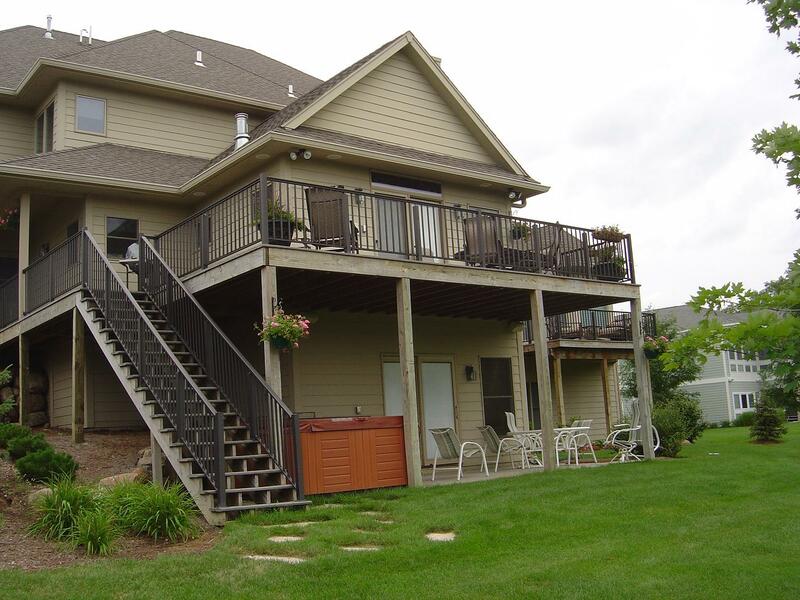 By Thanksgiving, we had the structure completed and the composite decking going down, the lower-level deck was completed as was the aforementioned concrete patio. 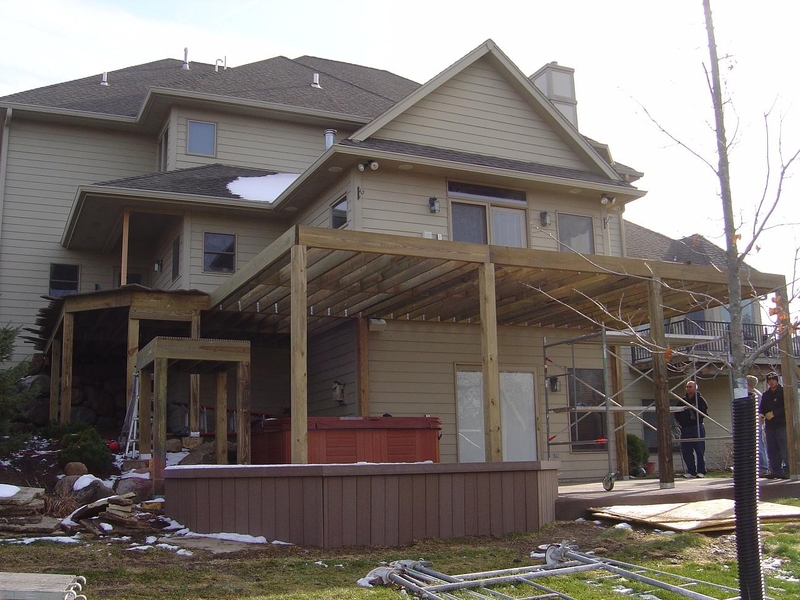 By late February, 2008, with the composite decking all laid and with the roof now on, the open porch had taken shape. All that was missing was some sun and some heat…and some railing…among other things. The installation of the stone (Cultured Stone) for the structural post bases, upper rail posts and the stone incorporated into the outdoor kitchen is temperature sensitive. So, it was May before our finishing touches were applied. But when they were, we had something. Something that was missing something, though. Ruth and Scott had always planned to do some landscaping around their new space. And that’s where Nate and Leah Hutchins of Stone Creations came into the picture. Ruth and Scott worked with Stone Creations independent of our involvement in the project…which is fine…we always appreciate folks who make our spaces, rooms and accessories look better! Nate and Leah’s beautiful hardscaping and waterscaping put the real finishing touches on an awesome outdoor living space. Thanks again to Sherry Failor and the staff at Welcome Home for featuring our projects. Thanks to Ruth and Scott Meyer for selecting our design/build services for their project…for putting up with our extended presence there over the “off-season” of 2007…and then some…and for participating in this feature. Go outside and play! Family style.